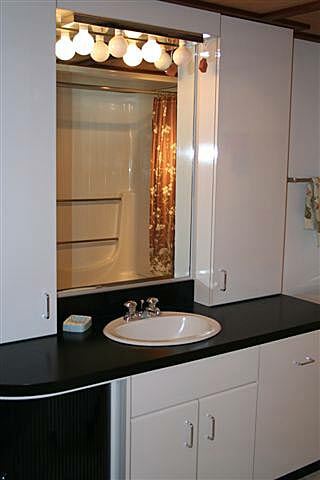 The primary reason that prompted my client to renovate her bathroom was the existing tub. She really wanted a walk-in shower. It gave us an opportunity to address the other issues, such as laminate cabinetry, lightingÂ and the overall ambience of the room. 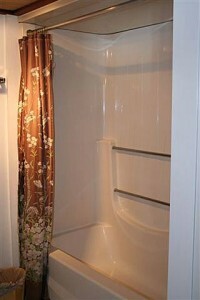 The most major structural change we made was making the shower â€œfeelâ€ so much larger by adding a 6â€ deep shelf and extending the upper part of the wall out the 6â€ as well (we were fortunate in that there was a storage area behind the shower wall and we were able to â€œstealâ€ the 6â€ without a problem). That doesnâ€™t sound like a lot of space, and it isnâ€™t, but it makes a huge difference in the end result. 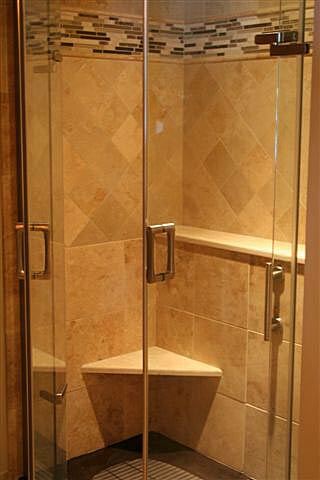 It has the additional benefit of giving her a great space to put sundry things that she will use in the shower. 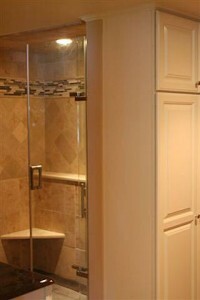 Installing the frameless shower door also visually expanded the space of the entire bathroom. You see straight thru the glass to the far wall of the shower making it feel part of the entire room. 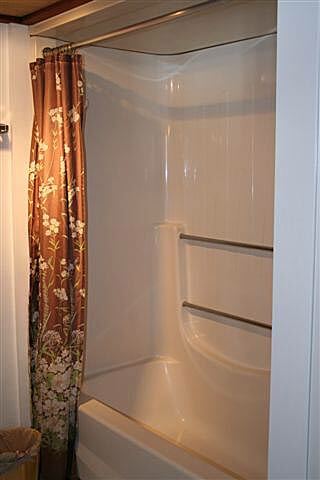 We liked the idea of the floor-to-ceiling storage area at the base of the shower area. We, again, had the space so we increased the depth from 12â€ to 15â€. These extra inches make it easier for accommodating large bath towels. Also, with all this storage we saw no need for a medicine cabinet over the sink. 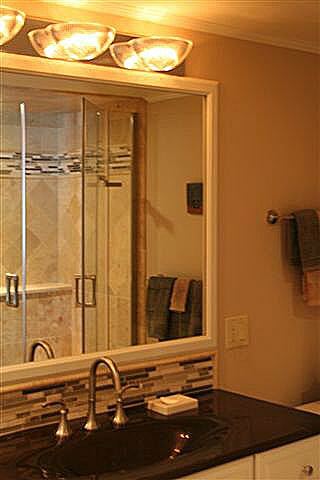 This enabled us to hang a large mirror which we framed in wood that matched the finish on the vanity. 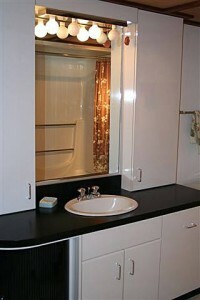 This also helped to visually expand the rather tight area between the sink and the shower. The lighting was inadequate. So, we installed a recessed light in the shower, two in the room itself and a fan light to remove the moisture (especially seeing as there is no window in the room. )Â The fixture above the sink purposely shines up to bounce light off the relatively low ceiling and back down to vanity top.Â This gives an added feeling of height in the room and is more interesting. 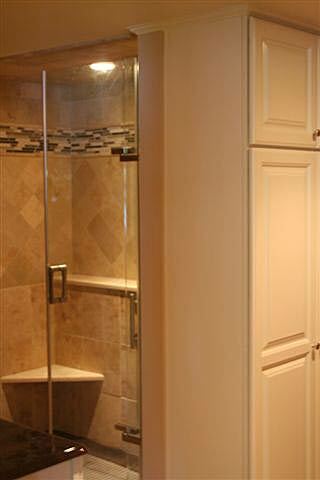 We chose travertine for the floor and the walls of the shower. We installed the floor on the diagonal (again to make the area â€œfeelâ€ larger and it really accomplishes that!). Â In the shower we put smaller tiles on the diagonal below the shelf and a border towards the top which correlates with the backsplash behind the vanity. 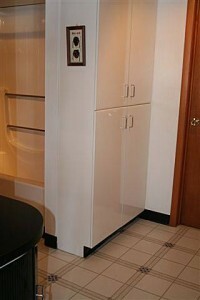 We selected â€œpearlâ€ painted cabinetry to add some contrast and keep the feeling light. My client seems to really enjoy the contrast in ambience from the previous bathroom. The selection of natural materials adds an undeniable richness to any project.